The way we seek change spiritually—working toward a better self and soul—amounts over time to very real spiritual growth. 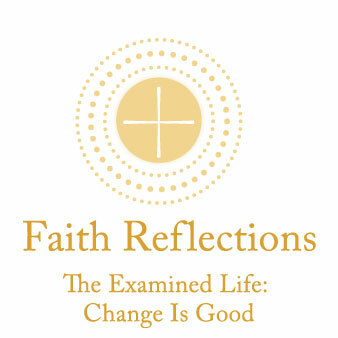 Our faith influences, and is influenced by, the changes we make in our lives for the better. An examined life is key to our growth as individuals who make a difference. The Apostles watched Jesus take time to reflect and struggle with the reality of who He was as the Son of God and our Savior. All the Gospels recount how He sought quiet places at various times, during struggles in particular, to reflect and pray. Matthew writes that Jesus did this especially as He became well-known with crowds surrounding Him. Though Jesus knew He was sharing the truth of God’s promises, it still took time in quiet reflection for Him to try to fully accept who He was and how His life’s purpose of saving us defined what He would suffer. He searched for God by reaching deep within Himself, in solitude. This practice of introspection opened up for Jesus a continual reaffirmation of His Father’s love for His Son. By witnessing this, the Apostles learned how to see themselves more clearly. Of course, it is truly a discipline to focus directly and mindfully on ourselves and the details of our thoughts, behaviors, actions, and omissions. We live primarily in relation to others as a spouse, sibling, parent, child, employee, boss, colleague, or friend. We know the kind of effort it can take to quiet the mind and find a regular, solitary space to reflect. The more we do it, the more comfortable it becomes to see our own strengths and areas for improvement—and the easier it becomes to match up our hope and vision for ourselves with discovered opportunities for growth. We are enriching our spiritual strength from within. In creating a fuller awareness of ourselves, we cultivate a wiser, stronger spiritual strength that will sustain us. This spiritual strength refreshes us; it supports thoughts, actions, and decisions for the better. This is a goodness that makes a difference. Prayer to St. Jude for Spiritual Growth: St. Jude, I open the door of my heart and invite Jesus to be at the center of my life. Direct me by His Holy Spirit to look within to find my strengths, weaknesses, and opportunities for growth. Help me to know myself well without defensiveness, without ego, without negativity. Guide my mind with clarity, and my spirit with humility. Amen.